Boehringer Ingelheim (BI) – one of the world’s top 20 pharma giants – is giving Oxfordshire Clinical Commissioning Group (OCCG) £750,000 to run three respiratory clinics in Chipping Norton, Banbury and Oxford until early next year. People in north Oxfordshire living with COPD and asthma will use the clinics as part of an integrated respiratory project, set up late last year by OCCG with BI. 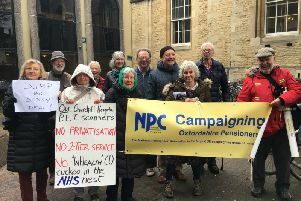 Joan Stewart of Keep Our NHS Public Oxfordshire (KONPOX) has submitted a freedom of information request to Oxon Clinical Commissioning Group asking questions over patient data. The group wants to know whether the company will have access to patients’ previous medical history and what use it will make of the information. It has concerns about a wealthy pharmaceutical company sponsoring a frontline service and believes the risks of the partnership have not been satisfactorily investigated by Oxfordshire joint health overview and scrutiny committee. “The patient data is one concern. Why do they need access to patient data? What is the purpose of them being involved? What’s in it for them as their statement of motivation seems very benign but you have to question why they want to be involved? I think we’re right to be suspicious of this,” said Mrs Stewart. “It is a threat to the principle of public funding of the NHS to allow commercial companies, especially big pharmaceuticals which appear to be wanting to get a foot in the door of the NHS. This one might be tightly controlled but what’s to prevent other pharma companies from attempting to run the NHS from inside? Mrs Stewart said in Companies House documents, in 2017 it was reported the biggest business risk for BI was market access. “This set alarm bells ringing that this is the way in they’ve been looking for,” she said. “The new integrated respiratory team enhances existing services for patients and for those who will benefit from an accurate diagnosis. An OCCG spokesman said: “BI is not able to influence the individual care of any patient and does not work delivering the service as this is provided by NHS staff.